Feb. 26, 2018 - Read all the latest information compiled by Canadian Forest Industries on what's out there in dust control to keep your operation running smoothly and safely. The Allied Back Blast Dampers (BBDs) are built in Canada and designed for easy installation, inspection, and maintenance. The instrumentation meets North American standards to easily integrate into a plant or mill PLC system and is available in Class 2 Div 2. The BBD can resist a vented dust collector explosion reaching a Pred of 5 psi (0.35 bar) for dusts with a Kst of up to 200 bar-m/sec. 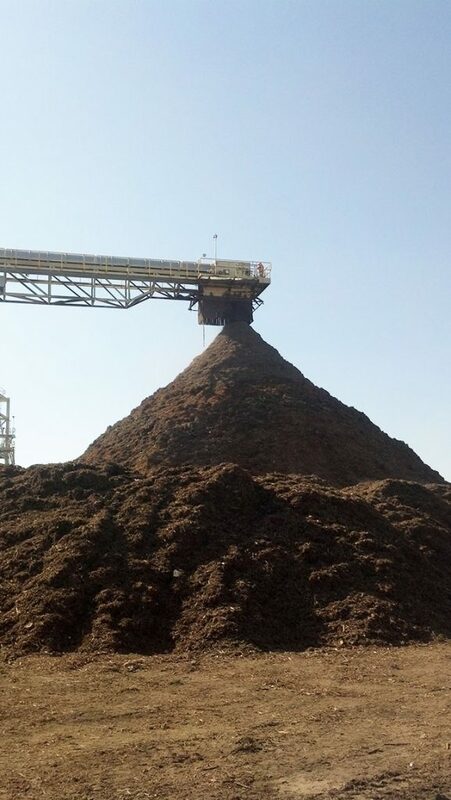 This range provides safe operation for a large range of deflagrable dusts used in industry. A combination of Allied BDD and an Allied’s NFPA certified rotary feeders can provide NFPA compliant passive isolation for large sized systems. Scientific Dust Collectors’ unique new cleaning nozzle provides an improvement in cleaning technology that achieves superior performance even at lower compressed air levels. These levels can be as low as 80 psig. In addition, SDC’s unique baghouse design removes flow-restricting venturies, thus reducing the filtered air velocity and saving you 2”WC on your fan requirements. These energy savings are unique to the industry. Spanning over half a century, Kice experience in designing and building filter systems provides an insight unique in the market. Kice has studied filtration principles and developed some of their own, many of which are patented. 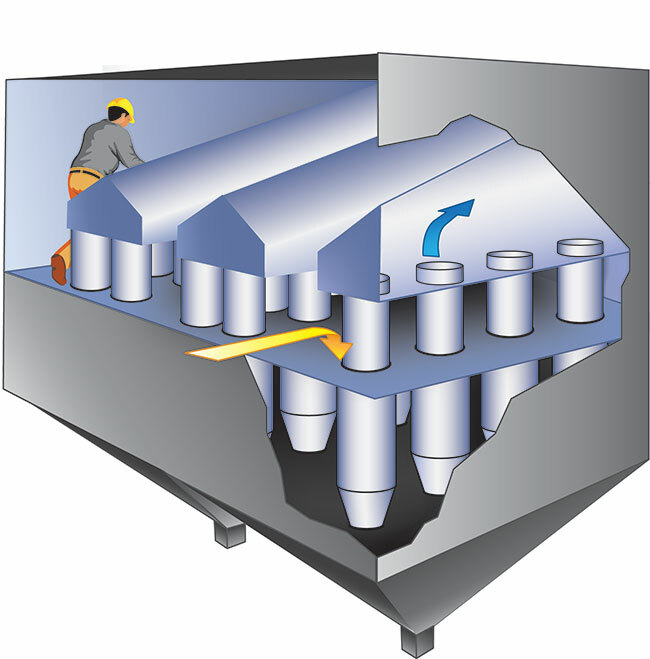 For maximum operating efficiency, the dust must be allowed to settle into the hopper for discharge out of the system. If bags are spaced too closely together or if the housing size is too small, excessive “can velocity” results, holding the dust in suspension. Suspended dust can choke the system regardless of the cleaning mechanism and air to cloth ratio. Kice filters are conservatively designed to provide proper bag spacing, which eliminates this potential problem. 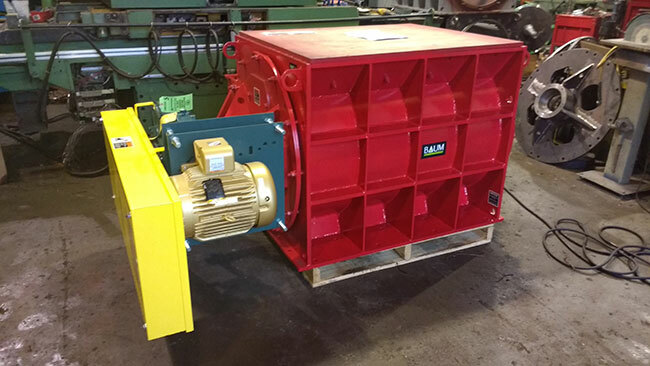 Baum Pneumatics, now in its 18th year, has hundreds of systems, thousands of feeders and blowers in service across Canada, also designing and fabricating a heavy duty disc scalping screen for chips, hog, and sawdust. High Pressure Pneumatics is a conveying system using standard commercial quality steel pipe, where fine dust is an issue keeping the dust in a 100 per cent sealed pipe reduces clean up and safety issues. Baum Pneumatics new product line has also been re-engineered with Computational Fluid Dynamics (CFD), incorporating 40 new product improvements in efficiency that reduce a pneumatic conveying system design to half the horsepower of what would have been required 20 years ago. ProcessBarron’s 24” tube size Mechanical Dust Collectors are the latest generation, and best performing pre-cleaning devices available for use in any solid fuel boiler application. Individual tube assemblies are arranged for parallel operation in a square or rectangular housing and use centrifugal force and gravity to remove particulate from the flue gas coming out of the boiler. This equipment is used almost exclusively to protect system ID fans from larger particulate that causes wear (over 15 microns). The 24” Mechanical Dust Collector requires a low-pressure drop (3.00” WG), and promotes equal airflow distribution to achieve above average overall particulate removal. Sizing flexibility allows for easy retrofit applications with minimal ductwork, structural steel or foundation modifications. 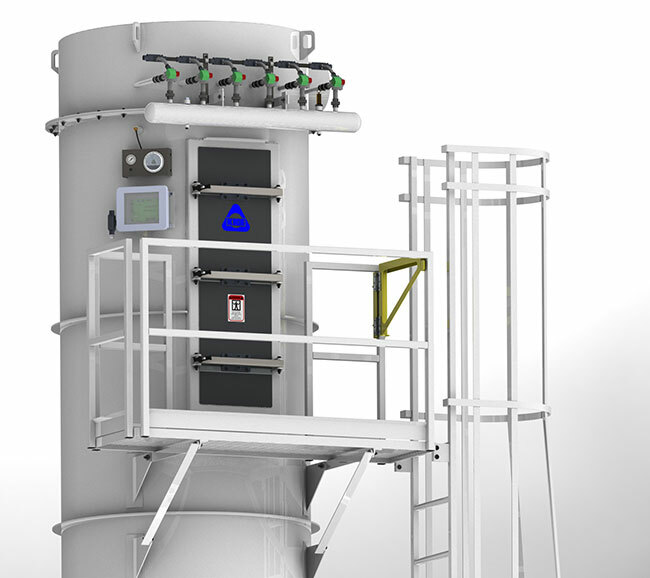 The Airex Cyclopulse cyclonic effect baghouse dust collector is the best concept for critically heavy dust load applications. The Airex Cyclopulse is equipped with a cyclonic pre-separation module that is ideal for heavy dust loads because it limits the particles that are filtered in its media-filtering module. The self-cleaning system is built according to an optimal concept of nozzles and venturis that reduces compressed air consumption. 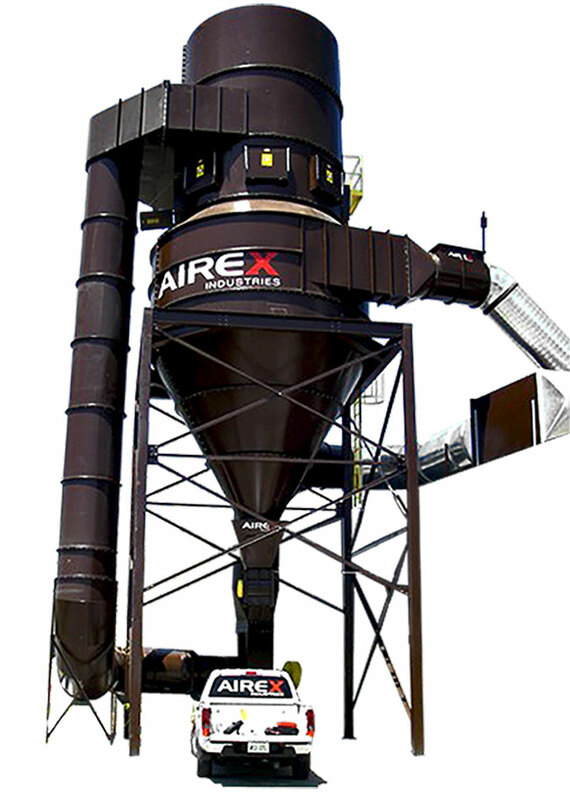 The Airex Cyclopulse ranks among the top available dust collecting systems for the wood processing industry and other heavy dust load applications. It will meet even the most strict industry standards. Mid-South Engineering can supply design and specification of industrial fume and dust control systems for a company’s specific needs. Mid-South Engineering has the experience and background in troubleshooting and engineering solutions to maximize performance of industrial systems. Properly designed systems operate more effectively and efficiently with less air than poorly designed systems. Lower required airflow means less fan horsepower utilized, which can reduce operating expenses. Poorly optimized systems cost money, both in operational efficiency and employee health. Mid-South Engineering provides design services to eliminate these problems and put a company back on track for optimal safety, efficiency, and performance. 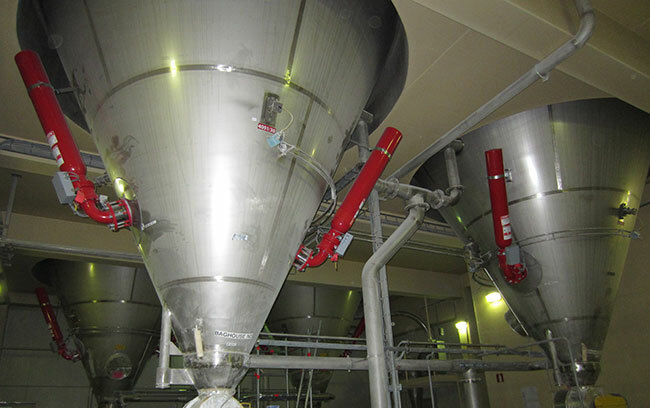 CV Technology’s Interceptor-HRD chemical suppression system is designed to provide an active method to protect process system equipment from a dust explosion hazard. The fundamental operation of the Interceptor-HRD system is detection of the pressure rise during the initial stage of an explosion, followed by fast injection and homogeneous distribution of an extinguishing agent into the protected vessel. The chemical suppression system consists of a controller, pressure or optical detectors, and the high rate discharge (HRD) bottles. The Flamex Spark Detection and Extinguishing System a cost-effective solution for the prevention of common baghouse fires and explosions. 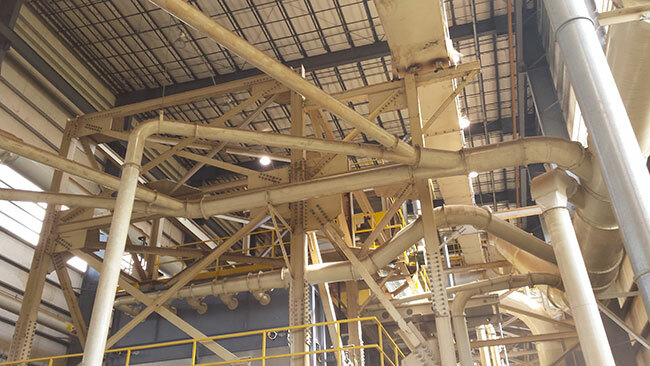 The Flamex system is specifically designed to detect and suppress sparks in pneumatic ductwork before they can reach dust collectors or storage bins. 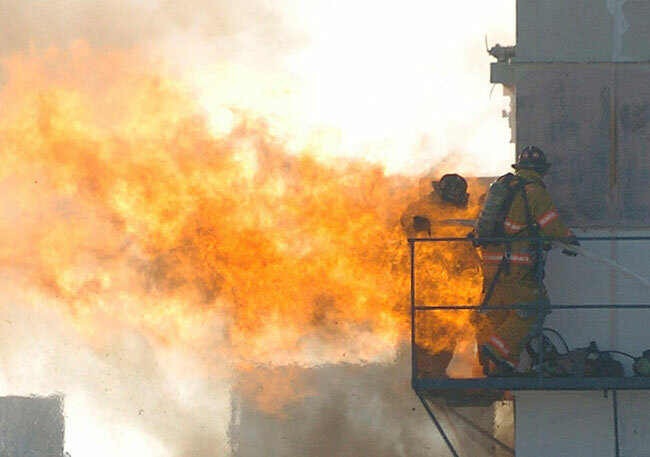 Infrared detectors sense burning embers or sparks transported through ductwork to a dust collector, and an extinguishing device is then triggered to effectively extinguish the spark within a fraction of a second. The system can also be programmed to activate other extinguishing agents, alarms, abort mechanisms or to shut down equipment. Founded in 1921 VETS Sheet Metal serves Western Canada’s wood and biomass industries’ dust collection and HVAC needs. The company’s strength is building and installing dust containment, abatement and suppression systems that meet stringent NFPA guidelines and significantly reduce our client’s cleanup and operating costs. VETS has installed numerous NFPA compliant systems with third party verified emission test results. A number of VETS’ supplied and/or installed multi-cyclone systems have had impressive air emission readings measuring an average PM emission rate of 0.006g per KG of effluent particulate matter released in the atmosphere. This is 15 times below the maximum allowable emissions as per the Alberta government’s 2006 code of practice for new sawmills (0.09g per KG of effluent). 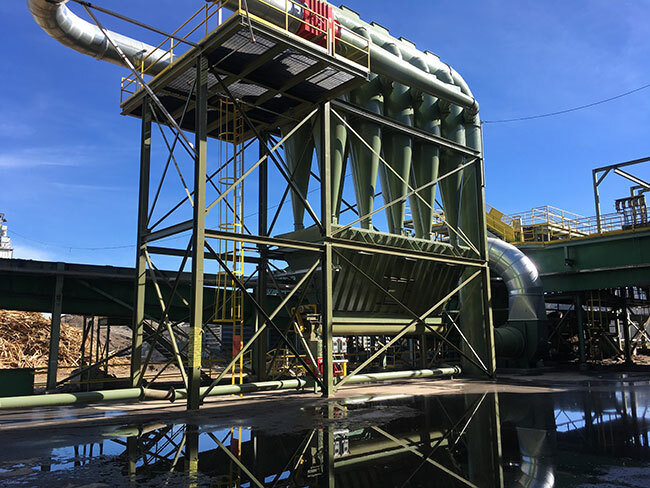 With over 70 years of field experience in providing dust explosion protection systems, Fike’s team of engineers, application specialists and combustion researchers understand the complexities of plant processes, relevant code compliance and the critical nature of plant operation. Fike designs and provides venting, suppression and isolation systems to ensure the safest and most effective solutions for plant and employee protection. 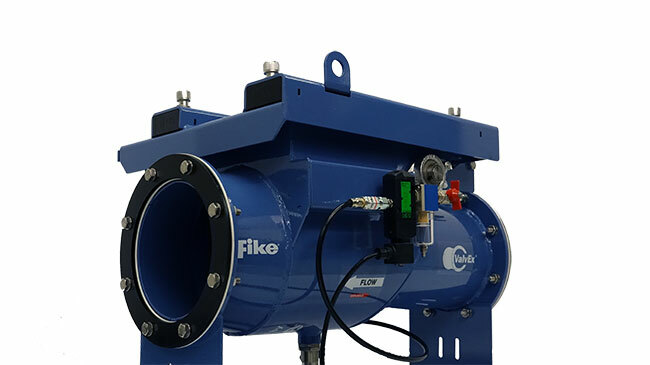 Fike’s updated second generation ValvEx is a passive explosion isolation valve engineered to prevent flame and pressure propagation through interconnected pipes, ducts or conveying lines. 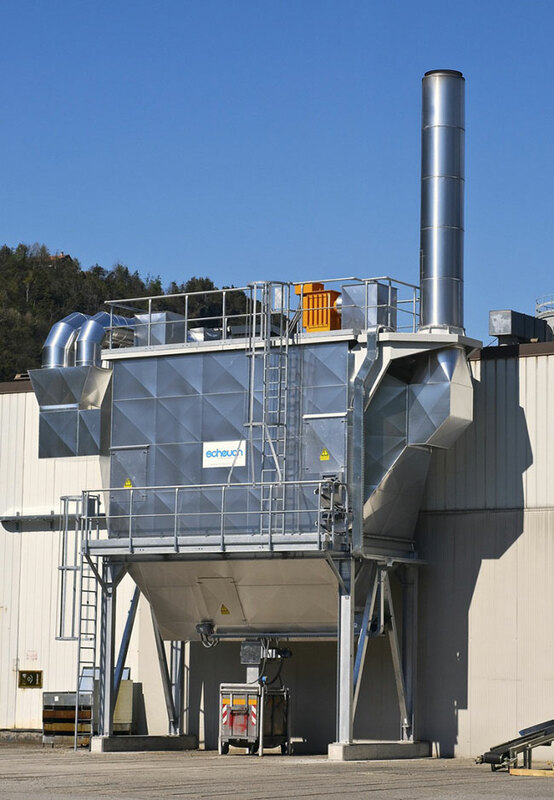 As an international market leader in the ventilation and environmental technology sector, Scheuch Group provides trend-setting complete solutions for dust filtration and exhaust gas cleaning. Scheuch’s key technologies include fabric- and cartridge-type dust collectors, dry and wet electrostatic precipitators, centrifugal separators, systems for the removal of mercury, acid gases and other HAPs, pneumatic conveying systems, and heat/energy recovery systems. With the acquisitions of Camcorp Inc. and Scheuch Engineering, Scheuch is well placed to respond to the industry needs. 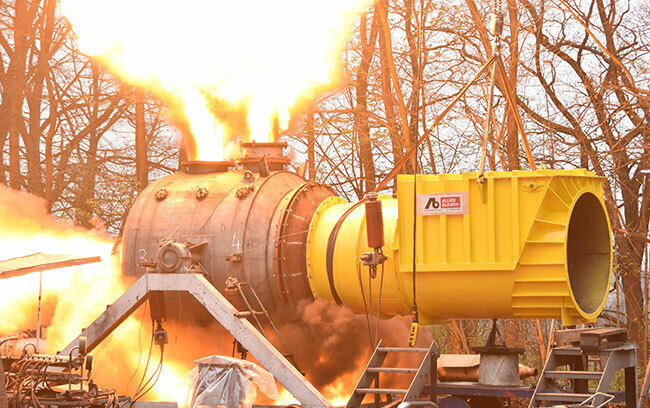 IEP Technologies is a worldwide leader in explosion protection systems and services. 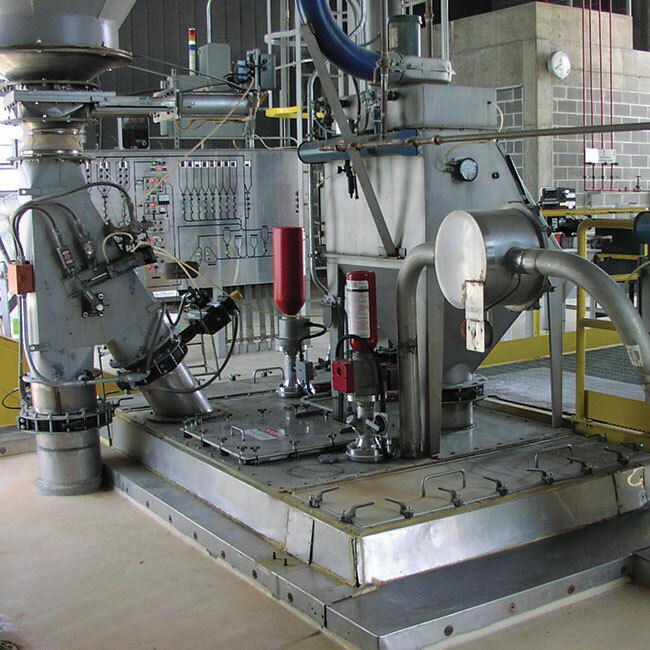 For over 60 years and 15,000 installations, IEP Technologies has provided solutions to prevent, suppress, isolate and vent explosions in industrial processes. Whether the application calls for a static grounding system for explosion prevention, a detection and suppression system, a venting device, a custom isolation system, or any combination, IEP Technologies can meet the challenge. Veteran engineers can respond with a turn-key solution including material testing, system design, installation, 24-hour global service and user training. Benetech knows dust control involves more than using a chemical. It also requires a customized, flexible program that applies dust suppression methods based on premium technology, support and maintenance. Benetech engineers specialize in designing, fabricating and installing systems for dust control and suppression. 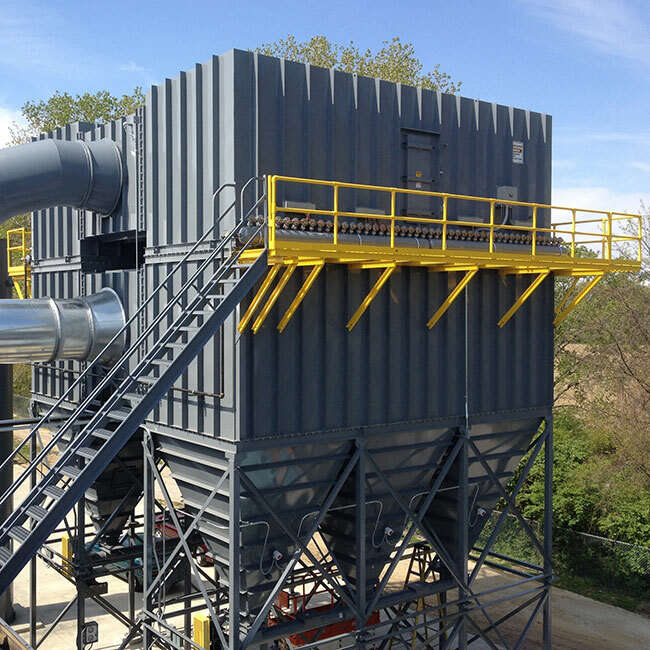 Benetech’s products, services and technologies deliver industrial dust control systems that improve air quality, control harmful emissions, reduce the risk of fire and explosions, comply with regulations, lessen transfer costs, increase equipment’s longevity, enhance production time, and minimize operating costs caused by lost material.